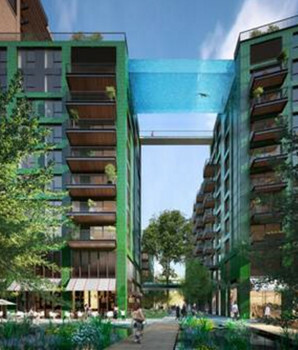 The ‘Sky Pool’ will link two residential buildings at the 10th floor and allow residents to swim from one building to the other. The pool is entirely transparent and structure free, 25m long, 5m wide and 3m deep with a water depth of 1.2m. 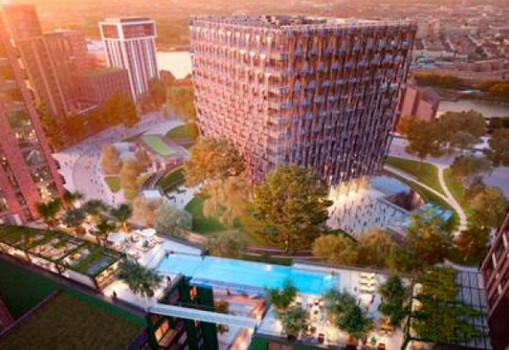 Designed by Arup Associates, with specialist input from Eckersley O’Callaghan and aquarium designers Reynolds, the pool will have glass that is 20 cm thick. Sean Mulryan, Chairman and CEO of developer Ballymore Group has been the driving force behind the pool. Ballymore and partners Eco World are developing the second phase as Eco World Ballymore.